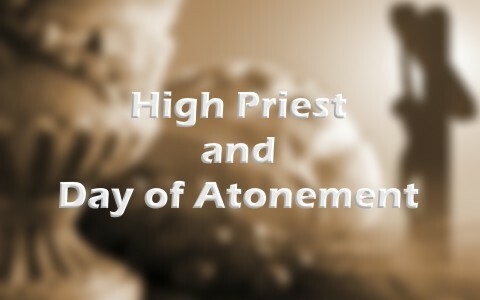 What Did The High Priest Do On The Day Of Atonement? What did the high priest do on the Day of Atonement, and what were the meanings of his duties? The high priest served as a mediator between God and the people, and was the only one who had close contact with the Holy of Holies, and that only once a year (Day of Atonement). His and the other priests offering animal sacrifices along with other ordinances, would cover the people’s sins, but it had to be repeated because people kept sinning, so the high priests duty was so important that if really was a matter of life or deaf because if he made a mistake, he could be instantly killed. When David was king of Israel, Uzzah touched the ark to keep it from falling and God “struck him down because he put out his hand to the ark, and he died there before God” (1st Chron 13:10). That seems harsh to us, but the priests were supposed to be carrying the ark, not just anyone, and it wasn’t supposed to be moved by an ox cart, but moved only by polls that the priests carried, so ox replaced the priests, the cart replaced the polls, and Uzzah replaced the high priests. That’s a fatality waiting to happen…and it did. They were treating what is holy like that which is common, and that’s a very dangerous thing for anyone to do. The ark represented the presence of God, and taught all of Israel that they must show a deep, abiding reverence for the things of God, and when you approach God, for He is altogether holy, holy, holy. It might surprise you that the Book of Hebrews has more references about the high priest than any other book in the Bible (18), and the references are intended to show the vast differences between a human priesthood, which had to be repeated over and over again and only covered sins, with the Mediator, the High Priest Himself, Jesus Christ, Who not only brings the forgiveness of sins, but takes our sins away forever (Psalm 103:12). Jesus doesn’t have to return to Calvary every time we sin because every sin we’ve sinned and will sin is covered by the blood of the Lamb of God, Jesus Christ. This doesn’t mean that we should repent of it, and confess it to God. Of course we should (1st John 1:9), but we have the perfect High Priest Who abides forever and even intercedes on our behalf to the Father. That’s what the Old Testament priests did, but the new and better High Priest doesn’t need to enter the temple over and over again because He is already at the right hand of the Father (Acts 2:33). The Day of Atonement is better known to the Jews as Yom Kippur. In the Old Testament, the priest had to get everything perfect on that day because this was a very somber day. It was the only one of the feasts where a commanded fast was to be observed. The reason for the fast was to afflict oneself and to loathe oneself over their own sinfulness. No one is an exception because every one of us sin (Rom 3:10-12) and fall infinitely short of God’s glory (Rom 3:23), so the Day of Atonement included the command for everyone to fast to help humble the people. For the Jews, it was the holiest day of the year. It also pictures the coming of the Messiah Who will restore all things, including the nation of Israel. Yom Kippur is actually written “Yom Ha-Kippurim” and reads as “a day of Purim” or a “day of deliverance,” and for the ancient Israelites, it was a day of deliverance from their sins, but today, it points to Jesus atoning for our sins and taking upon Himself the wrath of God that we deserved. However, Jesus’ life, death, and resurrection mean our separation from God is removed and we can now be “at one” with God. First of all, they would cast lots over which goat to sacrifice and then tie a tongue-shaped piece of scarlet cloth tied to the horn of the Azazel or scapegoat. Next, the goat would be placed before the people and wait until all their sins were laid upon him, after which the priest would offer the sacrifice of a bullock, and only then could the high priest enter the Most Holy Place, or the Holy of Holies. The priest entered into the Most Holy Place the first time to burn incense, representing the prayers of the priests, and then enters a second time with the blood of the bullock. The third time the priest enters the Holy of Holies is to sprinkle the blood of the goat on the mercy seat. He also sprinkles it toward (but not on) the veil, the altar of incense, and then the burnt-offering. That’s when the high priest lays the personal sins and guilt of all the people on the scapegoat, where confession is made over it and the goat is led away to die, sometimes pushed over a precipice to ensure its death. Then it’s the high priest’s reading and prayers in the Court of the Women before he puts on the golden garments to offer the burnt and other sacrifices. After this, he enters the Most Holy Place one last time where he offers the burnt offering and the other sacrifices. The Day of Atonement foreshadowed the work of Christ and has been fulfilled at the cross where He Who knew no sin died for those who are sinners (2nd Cor 5:21); the innocent dying for the guilty; the Perfect dying for the imperfect, and so He “entered once for all into the holy places, not by means of the blood of goats and calves but by means of his own blood, thus securing an eternal redemption” (Heb 9:12), because animal sacrifices were never enough, and so “Christ has entered, not into holy places made with hands, which are copies of the true things, but into heaven itself, now to appear in the presence of God on our behalf. Nor was it to offer himself repeatedly, as the high priest enters the holy places every year with blood not his own, for then he would have had to suffer repeatedly since the foundation of the world. But as it is, he has appeared once for all at the end of the ages to put away sin by the sacrifice of himself” (Heb 9:24-26). More here: What Does Atonement Mean? Another conclusion that can be drawn… The priest has to know when the day of atonement is. If the calendar shifts and the “seventh” month falls out of alignment(or the year for the traveller effected by death starts late; Pesach sheni); then the priest is at risk of going in at the wrong time. In Elul the king goes out into the field. 40 days later is the day the pebble sinks into the forehead. This “rosh/head” gets killed twice. Once by the pebble and once by the sword. Just as David kills “it”(singular); a bear and a lion (plural). Just as Samson bets 30 sheets and 30 garments; but only pays up 30 (he was off by 30). It is just like David’s meeting in the field that was rehearsed (practice round). Is the real Tishri yet to come? Previous post: Did The High Priest Have A Rope Tied Around Him When Entering The Holy of Holies?